SHT75 from Sensiron is a fully calibrated (calibration constants are programmed individually to each sensor) digital output sensor. It has a I2C like (not compatible with I2C) interface. The sensors are really accurate. I have noticed three sensors close to each other giving an output only deviating by 0.1C of each other. 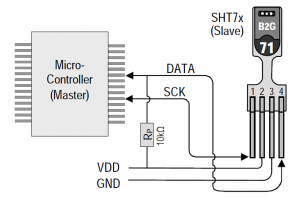 The attached source code is derived from an application note provided by Sensiron for interfacing SHT7X sensors to 8051 microcontrollers. Please note this code has temperature/humidity conversion coefficients for older (prior to V4) SHT75 sensors. If you use a newer V4 sensor update the conversion coefficients. The code was written for a PIC18F4580 IC and was compiled with HI-TECH PIC18 compiler. Freely distributable in this original form. I am writing code for the same sensor. Although I am using a HC12 micro controller. I have a few questions for you if you wouldn’t mind offering your assistance. please feel free to contact me through email and I will send you my questions. Thanks in advance. Since I don’t have access to any development tool, I cannot help much. But some steps in porting. 1. Start with skeleton code which just output something as the SHT75 code. Make sure your primary output method (serial terminal/LCD/SSD) works. 2. Don’t use any delay/serial/clock related routines attached above. Use the routines provided by compiler. 3. Make sure the pins used in SHT75 codes are set to digital-IO (not assigned to any peripheral). Two LEDs/switches connected to pins can be used to verify this. 4. 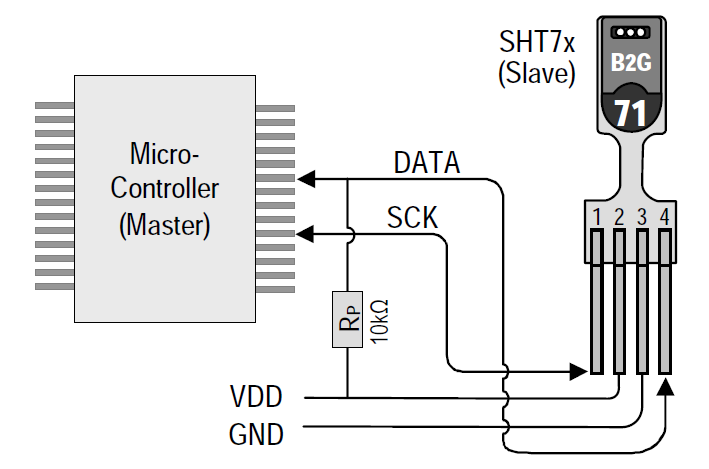 Make sure you use the pull-up resistor in SHT75 data-pin. 6.If you have an oscilloscope you can see the actual timing for communication and would help you very much in debugging. Hi! I’m developing a class for the SHT75 sensor for mbed. Source code is already given, but they are too complicated. I want to develop a simple. Could you please show the .h and .cpp of the class? Sorry, I did not see the file to download. Download link is at the end of above code. There is a ‘C’ source and header, you can covert it into a class.